Snooper S6800 Bus and Coach sat nav is part of a new range of navigation devices designed specifically for drivers of coaches and buses in mind. Featuring a large 7-inch slim wide touchscreen, the S6800 also includes Lane Guidance and Junction View to help guide your bus or coach along your route with turn-by-turn voice directions. The Snooper S6800 is also compatible with the Tyre Pilot so you check your tyres pressure on your sat nav screen. Snooper Bus and Coach S6800 also features Bluetooth for handsfree calls and provides FREE TMC Traffic information. The S6800 is preloaded with European maps which are free to update for the lifetime of the product. Snooper S6800 Bus and Coach Pro Europe has been discontinued. View the latest range of bus and coach sat navs. Snooper S6800 Bus and Coach is a portable 7-inch satellite navigation system which has been designed for drivers of coaches and buses. ‣Snooper S6810 Bus and Coach - for drivers of coaches and buses. ‣Snooper S6810 Ventura - for drivers towing caravans or driving a motorhome, or large camper vans. The Snooper S6800 Bus and Coach model includes built-in Bluetooth technology and 100's of bus and coach points of interest. The launch of this Snooper system is an industry first that features the ability to only route you onto roads which are suitable for your coach or bus for excursions, day-trips and bus tours, etc. You can also optionally add a reversing camera to the Snooper S6800 Bus and Coach sat nav. The Snooper S6800 is the only Bus and Coach sat nav to be compatible Snoopers Tyre Pilot which will monitor the tyre pressure of your bus or coaches tyres. You will be able to read the tyre pressure on the sat nav screen at any time. This can help you achieve maximum performance from your bus or coach by saving fuel through fuel-efficiency savings. It can also help you stay legal on the road with the correct tyre pressure. Listen to turn by turn directions on your vehicles speakers using the built-in FM transmitter. Simply tune your bus or coaches radio to an unused frequency and set your Snooper S6800 to transmit on that frequency to listen in. 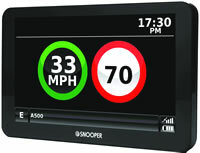 Also included with the Snooper S6800 is Free Premium TMC traffic information. Plus you will get Bluetooth handsfree technology so you can connect you mobile phone with your Snooper sat nav. With the Snooper S6800 you will get turn-by-turn directions to all your destinations. You can also program in 7 journeys with 16 stops along each journey you enter into the Snooper system. 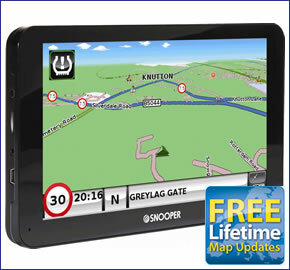 The Snooper S6800 Bus and Coach includes free map updates for European mapping so you will be able to navigate in your bus or coach on national journeys in the UK and international bus journeys with your snooper sat nav. Details of the offer and other models that include the FREE lifetime map updates can be found here. With the Snooper S6800 you will get many features to guide you along your route. Furthermore there are features that are specific to your Bus and Coach operator. Lane guidance and junction view help to ensure you are in the correct lane when approaching junctions, etc. You can also enter your vehicles dimensions such as height, width and weight and then your S6800 satnav will only route you along appropriate roads avoiding low bridges, weight restrictions, narrow roads and more. There are 1000's more attributes to protect you from hazards. The S6800 uses Snoopers AURA speed camera database to warn you to all fixed speed cameras in the UK and across Europe. If you want to get detection of ALL mobile speed cameras then you can upgrade by buying the Snooper Laser Pod. 100's of points of interest are available with this Bus and Coach sat nav including visitor attractions, Bus parking in Europe, restaurants, campsites, petrol stations, cash machines, airports, train stations, shops and many more. A feature called "Your Route" allows you to choose particular roads you want to travel on during your journey. You can also navigate view Junction Numbers. Whatsmore you can select a points of interest 'corridor' that allows you to navigate via particular points of interest. To make reading the device easier you can also also view road names and numbers at a larger size. Controlling your Snooper S6800 is also made simple with big buttons. You will find it easy and simple to enter addresses and scroll through the systems menu. A route timer is also included to set a alarm when you should be taking a break from driving. A car setting caters for use of the S6800 within a car. Speed limit alerts will be altered to use for driving in a car and dimensions will taken into consideration meaning you will no longer avoid bridges, narrow roads, etc. The battery life of the bus and coach S6800 is 1 hour. Snooper S6800 Bus and Coach mounts on the inside of your vehicles windscreen using the supplied suction cup windscreen bracket. Snooper S6800 Bus and Coach Sound can be powered directly either from its internal battery if it's fully charged or powered from the cigarette lighter socket. Snooper S6800 Bus and Coach provides advanced warning of all fixed speed cameras, SPECS and many laser sites using Snooper's AURA speed trap database. There are 3 easy ways to pay using a credit or debit card. The Snooper S6800 Bus and Coach comes supplied with everything you need to use it in your car (see What's in the box? above), however replacement and additional S6800 accessories are also available to buy from ActiveGPS.